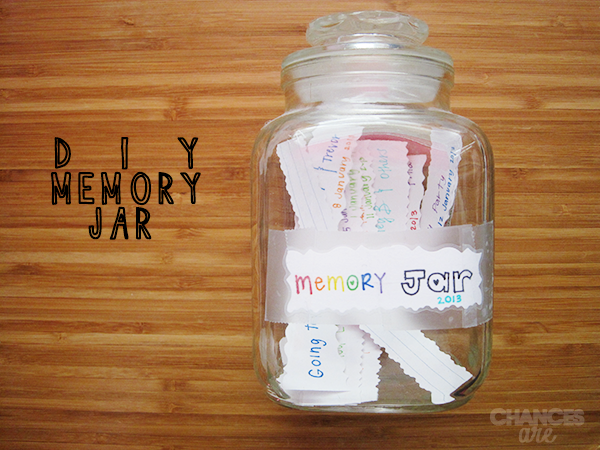 Chances Are: DIY: Memory Jar. Now that the first month of the year has come to an end, and we have created the first memories of 2013, I thought that this would be a great DIY project to try out. My bestfriend told me about this idea. He thought I would love it because I like projects and writing things down in a calendar. 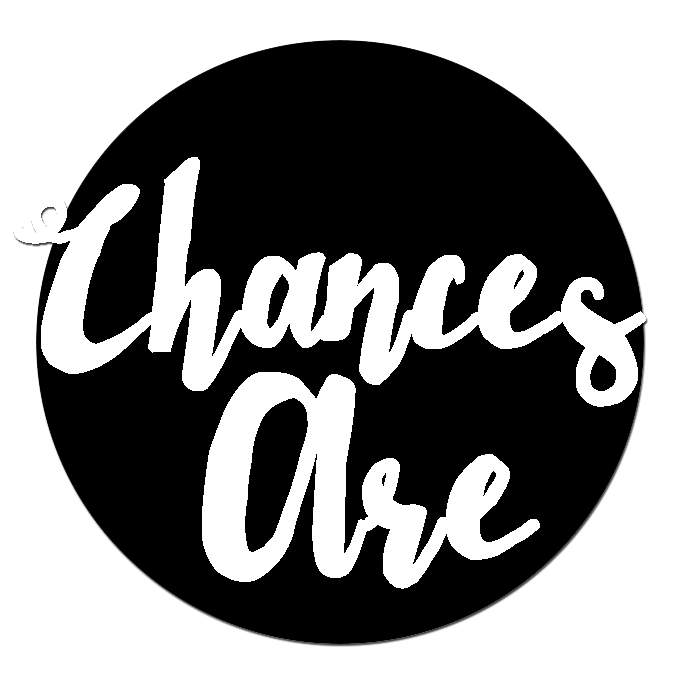 I decided to start this project and see what happens. I like to try new things, so why not? My plan is to read all of the memories, that I've written down, on New Year's Eve as a way to wrap up the year, reminisce over the great memories, and get ready to create new memories for 2014. I challenged him to make a memory jar too, so we can read our memories together on New Year's Eve. 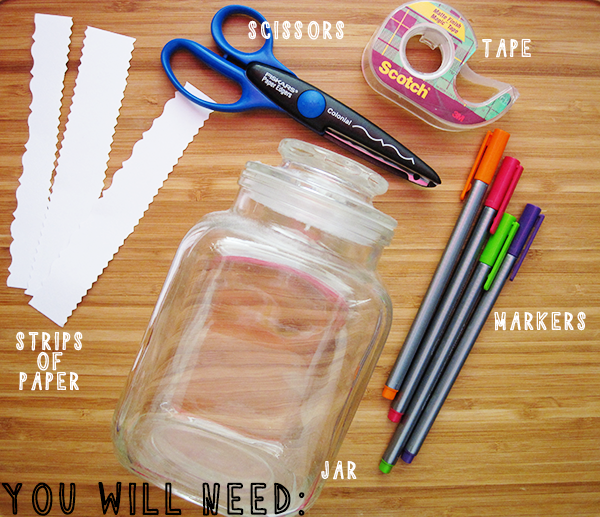 You will need: blank strips of paper, a jar you don't use anymore or need, markers/something to write with, tape, and scissors! I chose fun shape scissors, but you can use regular scissors. 1) Write memories! 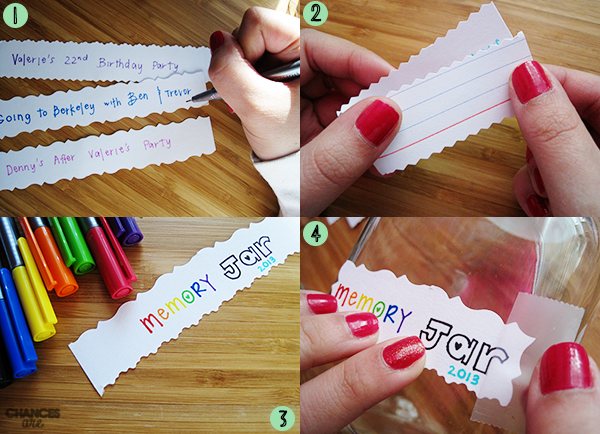 Take the blank strips of paper (I cut jumbo notecards into strips) and write memories on them. I kept it simple. I put the event then wrote the date on the bottom. 2) Fold the strips! This is optional. If you don't want to fold them, it's totally fine. 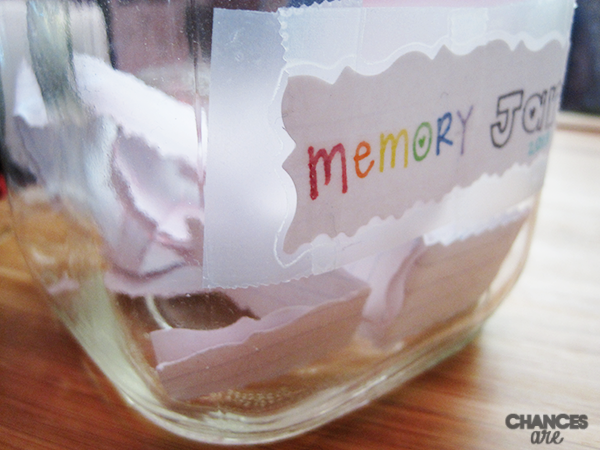 I personally think the memories look better when they are folded inside the jar. 3) Make a label! Using one of the strips of paper, make a label for the jar. Decorate it any way you want. I kept my label simple. 4) Tape the label! Tape the label onto the jar. I trimmed my label before taping it. After that, you're done! Just put the memories into the jar.